For me this year is all about learning new techniques. And as I really love working with scraps of yarn and use everything to the last millimetre, I have been busy collecting and testing new (for me) techniques of blending. 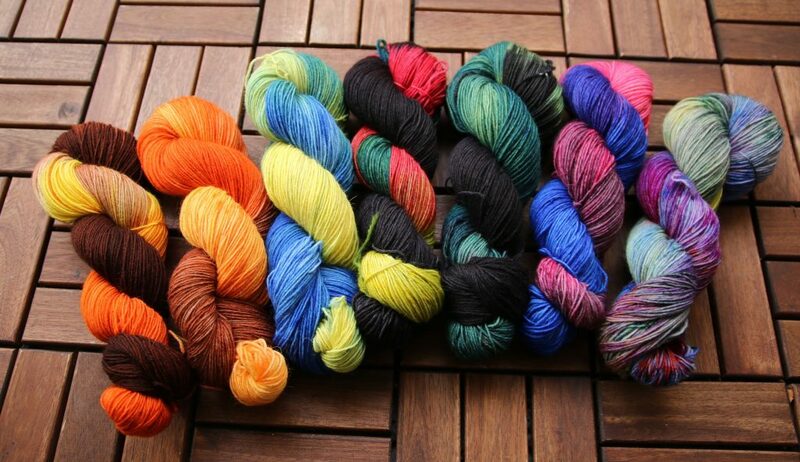 Here is a a small collection of ideas and techniques for blending your yarns. First off, some people like to get their things organized (Don’t know why, but, oh… well.) If you are working with leftovers, you might want to sort them according to colour and/or weight. If you don’t feel lucky like I do and don’t want to leave everything to chance, you could make a yarn cake out of leftovers. Let’s start with the easy methods. Like these. 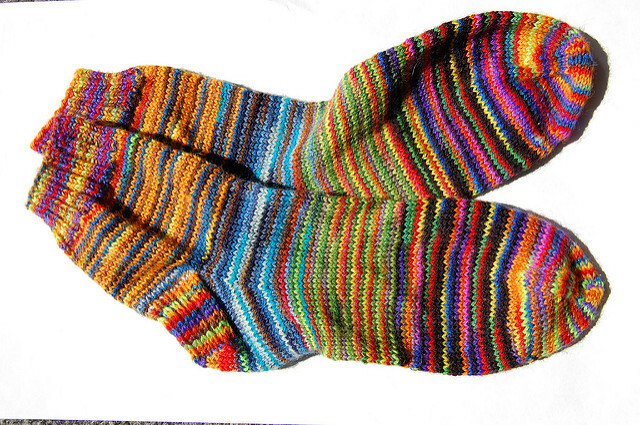 I used 6 different scraps of Opal sock yarn for this pair of happy scrappy socks (no pattern – use your standard go-to pattern or this free one). You can use any yarn, but I like this best on gradient yarns like Zauberball from Schoppewolle or similar. 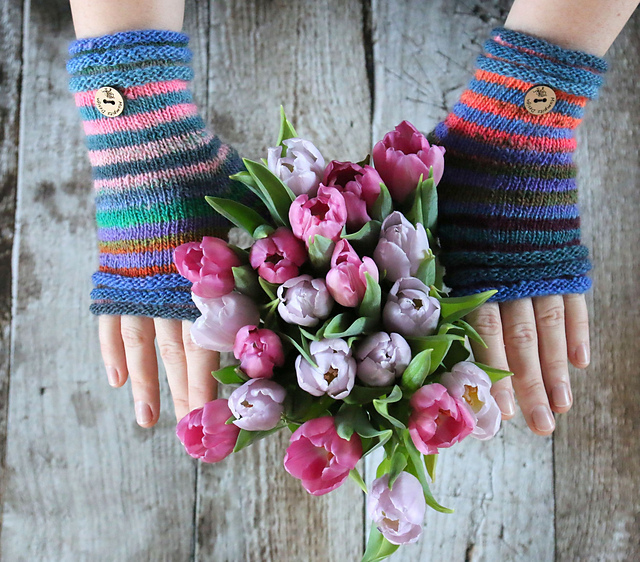 Use two contrasting scraps (about 15-20grams per colour and per pair of mittens) and knit stripes, changing colour every 4th (3rd or 7th, as you like!) round. Voila! 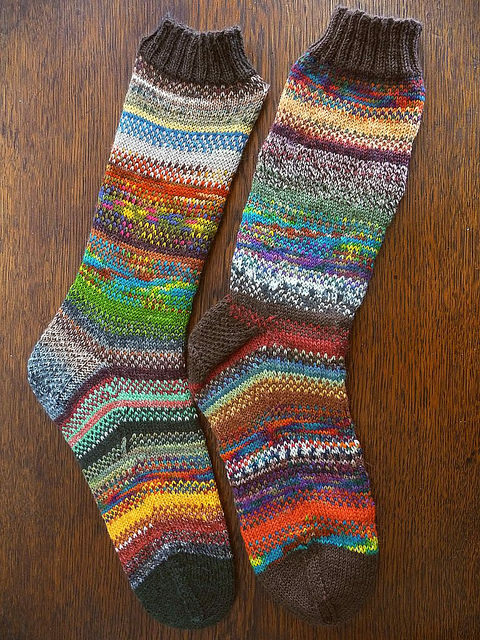 A unique pair of whatyouknitted! 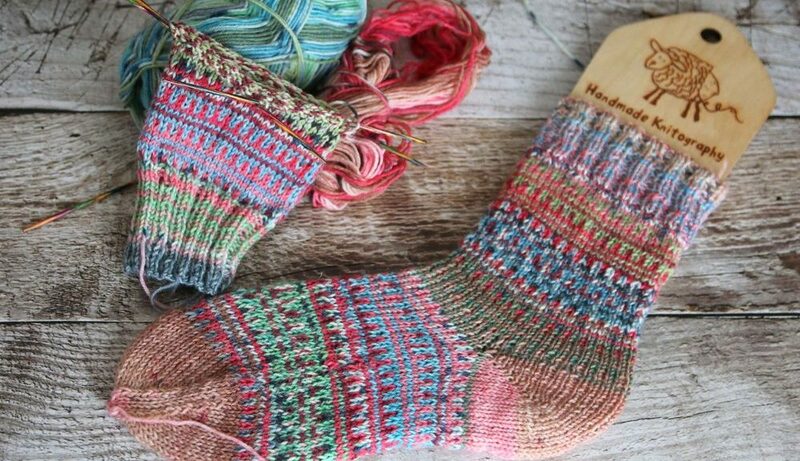 Scrap happy socks are the best! I added a German Short Row heel (See tutorial here) and cuff and toes in colour A only, but there’s definitely a million different solutions. Tell me your favourite when you find it! Knit 2 in one colour, 1 round in another colour, 1 round in a third colour, 2 rounds in the first colour, 3 rounds in the second colour, 1 round in the third… it keeps things interesting and makes for the coolest colourful projects! 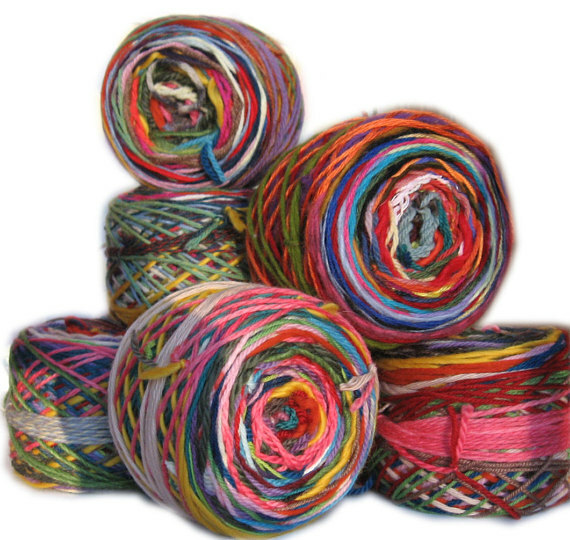 I must admit, though, that I never use more than two colours at a time as I don’t want to spend half of the time untangling the yarn strands. 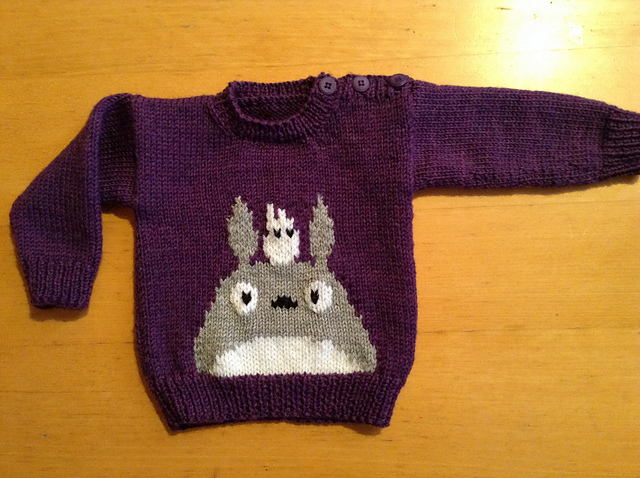 Or how about Intarsia? 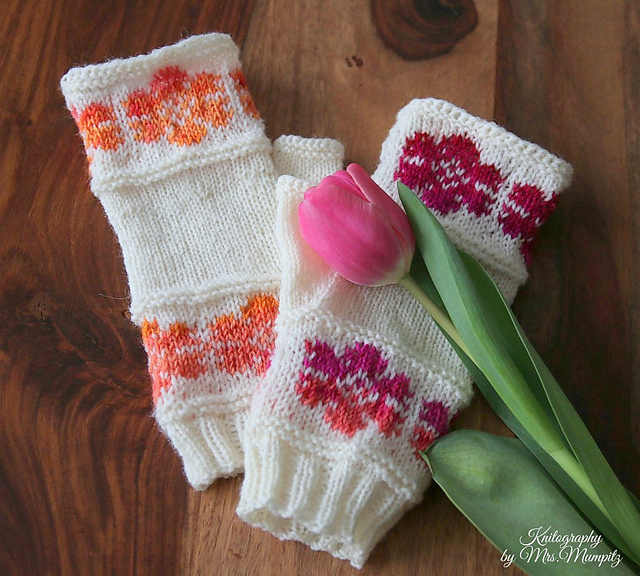 If you have some colourful scraps or yarns that don’t quite fit a bigger project on their own, why not mix them with a solid colour and make a special pair of socks/mittens/sweaters… out of it? There are so many wonderful charts for small intarsia out there that it’s hard to choose from. 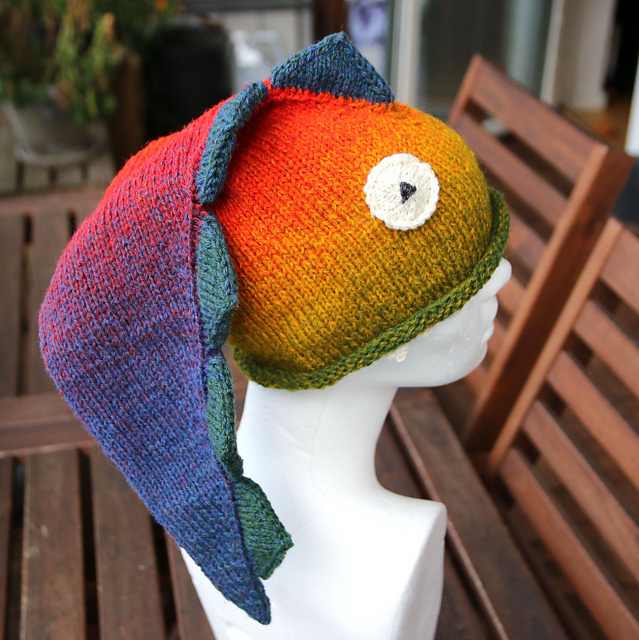 But here’s a pick of free intarsia charts on Ravelry for you. Oh, and then there is your pick of anything Fade. 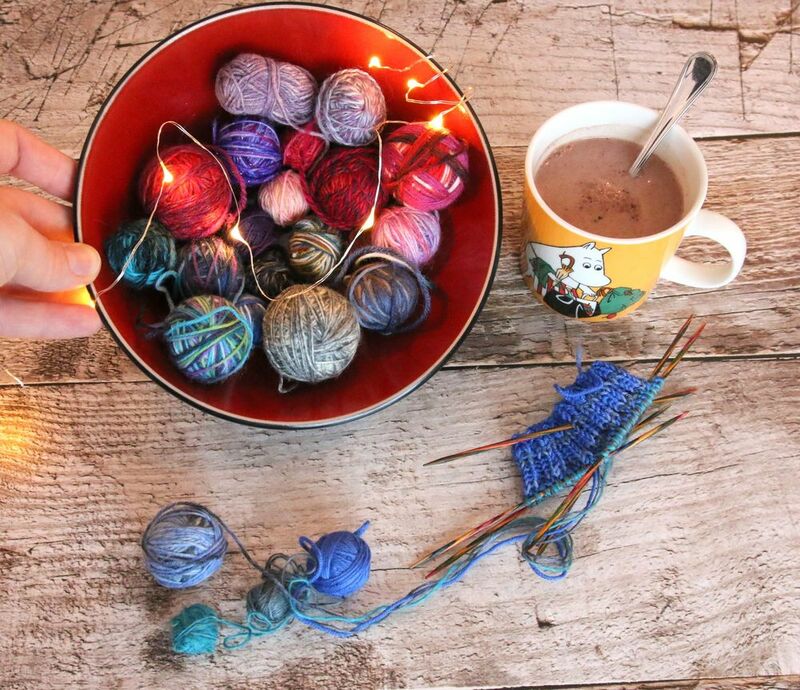 Apparently you’ll need plenty of these for a project, so it’ll be worth a month of knitting at least. But here you go. It could for example work like this: Start with color 1, knit in stockinette (or garter if you prefer) for say 20 rows/rounds (depending on size and intended blending effect) change to colour 2, knit 1-2 rows/rounds, change back to colour 1, knit slightly less rows/rounds than the first time, change back to colour 2, knit slightly more rows/rounds than the last time and so on, until you feel like it’s time for adding the next colour to the game. Repeat in the same fashion until you finish your project. You successfully faded your favourite colours into each other. Start with stranding: always alternate 1 st. of each two colors (A and B) over an odd (divisible by 4 +1) number of stitches. Knit 4 rows of stranding. Break Col A. Now knit 4 plain rows using color B. Adding color C knit 4 rows of stranding. Cut B, knit 4 plain rows in C. And so forth. And if you haven’t found enough inspiration here yet, I’m sure to keep an eye open for more inspiration for you. But for now I’m off knitting, as I expect a beautiful package to arrive soon, so my needles need to be ready to go then! What a great post! 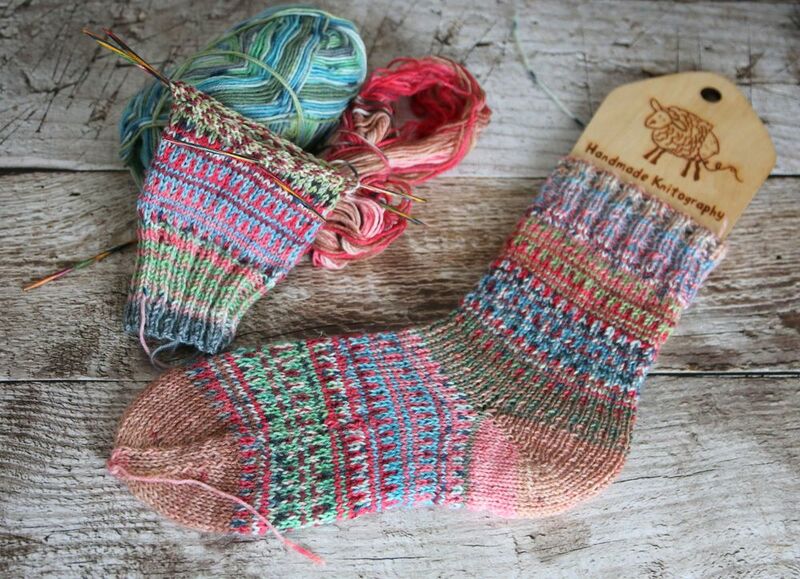 I’ve never really been into the sock knitting – heck, no one sees them inside your shoes but with these everyone will want to take their shoes off to show the socks. Every blend technique you show looks brilliant especially with those brilliant colors. And the hat! I have that pattern favorited and now I know how to choose the yarn. Thank you! I’m really glad it inspires you. Socks are so addictive!! And I love collecting scraps just for these 🙂 Hope to see some of your creations soon then! Lovely ideas! 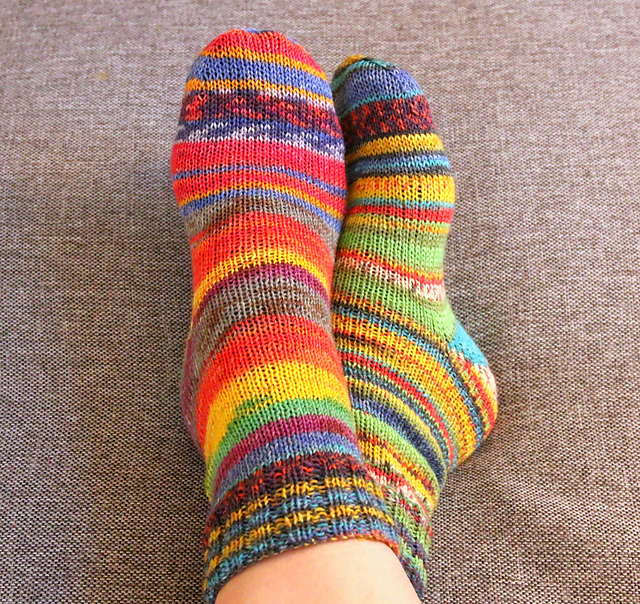 I couldn’t quite follow the instructions for Rnd 5 + 6 from the Instagram socks. It says “k1 Colour A, k1 and B around”. I think there might be a word wrong/missing? hej! Thank you for the heads up, indeed, it needs to read k1 Colour A, k1 Colour B around! I updated it and hope to see your lovely socks soon! !